The Williamsburg Bridge is one of the major crossings of the East River, carrying approximately 140,000 motorists, 92,000 transit riders, 600 bikers and 500 pedestrians between the boroughs of Manhattan and Brooklyn and serving some of the busiest arteries in New York City. When it opened in 1903, the Williamsburg Bridge was the longest suspension bridge in the world, with a span of 1600 feet and a total length of 7308 feet and the first with all-steel towers. The 310-foot steel towers support four cables, each measuring 18_ inches in diameter and weighing 4,344 tons. In all, nearly 17,500 miles of wire are used in the cables that suspend the bridge 135 feet above the East River. The massive stiffening trusses were designed not only to withstand high winds, but also to support rail traffic on the deck. The bridge links the New York City boroughs of Manhattan and Brooklyn. Carrying rail, trolley and roadways for carriages and pedestrians, it was one of the last major bridges designed for the horse and carriage. 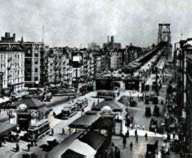 By the 1920s, the automobile was the major mode of transportation and the trolley tracks were replaced with roadways. Currently, the bridge carries four two-lane vehicular roadways, a south roadway (inner and outer) and north roadway (inner and outer), with two rapid transit tracks (J, M, and Z subway lines) sandwiched in between. A walkway and a bikeway also run across the bridge. 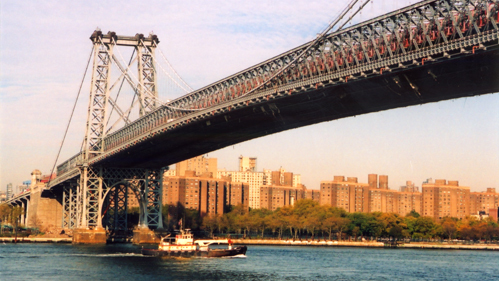 During the 1990's, the DOT invested more than $600 million in the Williamsburg Bridge. 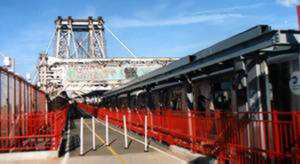 In 1991, the DOT began a major rehabilitation of the Williamsburg Bridge. The program was designed to undo the effects of age, weather, increased traffic volumes and deferred maintenance and prepare the bridge for another 100 years of service to the City of New York. Now that the DOT has completed work on Contract #7, all of the bridges supports and roadways, walkways and subway tracks have been completely rebuilt. For the City of New York and the many users who drive, walk or ride across the bridge every day, a major component of the New York City infrastructure has been preserved for future generations. For the ongoing work on the bridge, DOT's goal is to minimize the impact on the traveling public and local community by expediting the project. Contract milestone dates linked to a package of financial incentives and disincentives will either reward or penalize the contractor, depending on whether they meet or exceed the milestone dates. This incentive/disincentive clause has worked successfully in previous contracts. In 1997, the South Outer Roadways were reconstructed and reopened nine months ahead of schedule and in 1999, early completion of the Transit Structure allowed subway service across the bridge to be restored one month ahead of schedule. In 2001, the North Outer Roadway was reconstructed and reopened for traffic 50 days ahead of schedule on December 10. On June 10, 2002 work on the North Inner Roadway was completed and reopened for traffic, 50 days ahead of schedule. The work on Contract #8 was started on March 3, 2003. The project is scheduled to finish in June, 2012. This $173 million project will see the rehabilitation of the tower bearings, the truss system, the steel structure of all eight towers, and the north comfort station houses, the replacement or adjustment of the cable suspenders, the installation of maintenance travelers (inspection platforms) under the main span, as well as painting of the stiffening trusses. Architectural work will include the restoration of decorative lights and the Brooklyn granite stone monument. Work inside the anchorage houses on both the Manhattan and Brooklyn sides will include the construction of new stairs, a hoisting system, ventilation and lighting, and oiling platforms. The project will also include the installation of an Intelligent Transportation System (ITS). The work of painting the stiffening trusses on the South and North side began first. The painting of the South trusses (Stage 1A) started on June 1, 2003 and was completed on September 6, 2003. The painting of the North trusses (Stage 1B) started on September 6, 2003 and was completed on November 25, 2003. Both Clinton and Suffolk Streets were returned to their original direction, northbound and southbound respectively on June 28, 2002. Providing Park and Ride locations Citywide. To obtain the location of a Park and Ride lot near you contact DOT. Permanently close the bridge, which would shift traffic through local communities to one of the other already congested East River crossings. Build a new bridge, which require locating bridge approaches, possibly through the acquisition of stores and residences. Plus, the existing bridge would still require repairs while the new bridge was being built. Of those three options, the one with the least impact on drivers and local communities was the third. And in 1988, the decision was made to repair the Williamsburg Bridge while keeping it open. The Williamsburg Bridge Reconstruction Project is one of the most ambitious projects undertaken by the New York City Department of Transportation-Division of Bridges. In 1998, after two years of major reconstruction work, the DOT completed the South Inner and Outer Roadways of the Williamsburg Bridge. Over the course of those two years, NYCDOT completely reconstructed the Manhattan and Brooklyn south approach foundations, piers, columns and roadways and replaced the existing concrete and steel Main Span deck with a specially designed orthrotropic roadway deck. The new roadway deck is stronger and lighter than the original deck and with proper maintenance, is expected to have a longer life span than the original. In addition, a new South Pedestrian walkway/bikeway was installed. The major portion of the South Roadways reconstruction began on July 8, 1996, when all four Brooklyn-bound lanes were closed. At that time, all traffic was shifted to the four North Roadway lanes. Contract #5 represented a landmark achievement because DOT: maintained a smooth traffic flow between Manhattan and Brooklyn throughout reconstruction and reopened the South Outer Roadways to traffic 9 months ahead of schedule. The South Outer Roadways were reopened in August 1997, after only 14 months of construction. This early reopening was made possible with the addition of $27 million in acceleration money and through the extraordinary efforts of over 500 men and women contributing over 1.5 million hours of labor. Work on the Transit Structure began on May 1, 1999, with the suspension of J, M and Z subway service across the Williamsburg Bridge. Over the course of the next 4 months, the contractor replaced and rebuilt the transit structure including: Brooklyn and Manhattan transit approaches; main bridge transit stringers and hangers; center portion floor beam; subway tracks and all subway signal, communication and traction power systems from the transit approach in Brooklyn to the transit approach in Manhattan. Rebuilding the transit structure was a delicate and complicated operation. Unlike roadways, subway structures cannot be built in segments. Signal systems, tracks, communication and traction power systems need to function simultaneously; together these elements allow the subway trains to run; individually, they are useless. Therefore, the contractor had to construct and test the system at the same time. This meant suspending subway service for five months in 1999. To accommodate displaced J, M & Z riders during the five month service interruption, DOT and New York City Transit coordinated their efforts and implemented a transit service plan. Commuters were advised to avoid using the J, M & Z lines, and utilize added or increased services on alternative subway and bus routes. In addition, the fare on the B39 bus crossing the Williamsburg Bridge was eliminated during the service interruption and free bus/subway transfers were given at the Marcy Avenue and Delancey Street stations. During those five months, the contractor worked seven days a week and used multiple shifts and was able to restore subway service one month ahead of schedule. Work on the North Outer Roadway of the Williamsburg Bridge was finished almost two months ahead of schedule and was reopened to commercial and passenger vehicles on December 10, 2001. Work on the North Inner Roadway was completed 50 days ahead of schedule and was reopened on June 10, 2002. Additionally, the North Footwalk was fully reopened to pedestrians and bicyclists on December 12, 2002. The contract was completed on August 15, 2003. Yonkers Contracting Company was responsible for construction of the $202 million roadway contract, which featured a significant incentives for early completion of the roadway. The contractor was awarded $100,000 for each day the roadway was reopened ahead of the target date, or $5 million - the maximum allowed under the contract - for each of the North Outer Roadway and North Inner Roadway projects. The North Outer Roadway reopening was complemented by the New York State Department of Transportation's early reopening of the Marcy Avenue connector ramp from the Brooklyn-Queens Expressway to the Williamsburg Bridge. This is the first time in the State's history that a segmented highway bridge was built using technology suited to situations requiring rapid construction with minimal traffic and community impacts. The rebuilt footpath and bikeway complies with all regulations under the Americans with Disabilities Act (ADA).